Formiga, L.; Marquez, L.; Pujantell, J. Research on translation quality annotation and estimation usually makes use of standard language, sometimes related to a specific language genre or domain. However, real-life machine translation (MT), performed for instance by on-line translation services, has to cope with some extra dif- ficulties related to the usage of open, non-standard and noisy language. 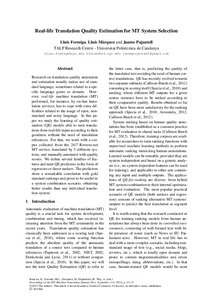 In this paper we study the learning of quality estimation (QE) models able to rank translations from real-life input according to their goodness without the need of translation references. For that, we work with a corpus collected from the 24/7 Reverso.net MT service, translated by 5 different MT systems, and manually annotated with quality scores. We define several families of features and train QE predictors in the form of regressors or direct rankers. The predictors show a remarkable correlation with gold standard rankings and prove to be useful in a system combination scenario, obtaining better results than any individual translation system. Formiga, L.; Marquez, L.; Pujantell, J. Real-life translation quality estimation for MT system selection. A: Machine Translation Summit. "Proceedings of Machine Translation Summit XIV". Niça: 2013, p. 69-76.